California Almonds Blanched Whole & Broken direct to you fresh from the farm from Just Almonds. Blanched whole and broken almonds are the second lowest USDA Grade. They are designed for commercial users and may contain up to .2% foreign material in any order including but not limited to shell pieces, rocks, or twig material. Food manufacturers, bakeries, and other product developers use this grade as a low cost alternative that allows them to sort through the product themselves. 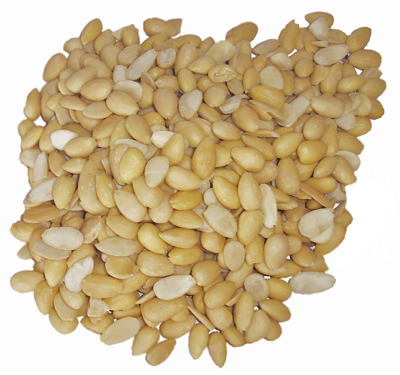 Blanched whole and broken almonds are a non-uniform assortment of almonds that can be used in baked goods, toppings, and cooking, where consistency of size is not important. These almonds have been scratched, dented, and broken during the hauling removing the outer shell and processing. These ARE NOT naturally flawed almonds. DO NOT buy this grade if you intend to eat these straight from the package. This product will normally have a dust appearance due to the skin particles adhering to the scratches and exposed meat areas. Our products are all current crops and ship directly from the source. No middlemen, repackaging, or mixing with other types of nuts (peanuts for example).